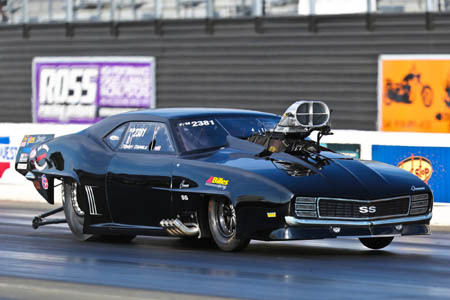 The Professional Drag Racers Association (PDRA) Road to the Finals begins this weekend at the first of eight races on the 2019 PDRA Tour, the PDRA East Coast Nationals presented by FuelTech, April 4-6 at GALOT Motorsports Park in Benson, N.C. Entering its sixth season, the PDRA will debut its new "Friday Night Fire" and "Main Event" formats. The all-eighth-mile drag racing series restructured its daily event schedule over the offseason in an effort to give fans more of what they want. PDRA Friday Night Fire will kick off at 6 p.m. with back-to-back qualifying sessions for the PDRA's professional classes. The Main Event begins Saturday at 4 p.m. with pro eliminations and the completion of sportsman eliminations. "The Friday Night Fire and Main Event formats will hopefully make our schedule a little more fan-friendly," said Tyler Crossnoe, race director, PDRA. "This new event schedule will make it easier for fans to finish work on Friday or go to their kids' ball game Saturday morning and still get to come out and watch an evening of pro drag racing." The professional class lineup for the East Coast Nationals features Moroso Pro Boost, Switzer Dynamics Pro Nitrous, Liberty's Gears Extreme Pro Stock, Schwing America Pro Outlaw 632 presented by Precision Chassis and Atomizer Racing Injectors Outlaw 10.5 presented by Drag 965. "We've got a really well-rounded lineup for the East Coast Nationals," Crossnoe said. "Aside from Drag 965 Pro Nitrous Motorcycle, which will kick off their season at Virginia in May, we've got all of our pro classes on tap. We'll also have Top Sportsman and Top Dragster with some of the best sportsman racers in the country, plus Coolshirt Pro Jr. Dragster presented by Knoxtown Products, Gilbert Motorsports Top Jr. Dragster and Edelbrock Bracket Bash for our young guns and local racers." Defending Pro Boost world champion Tommy D'Aprile and his Al Billes-tuned '69 Camaro will begin their title defense at the East Coast Nationals, fighting off a field of boosted entries including the new ProCharger-equipped Camaros of GALOT Motorsports drivers Kevin Rivenbark and John Strickland, as well as roots-blown drivers Chuck Ulsch, Ric Fleck and Melanie Salemi. Jason Harris enters the season as a two-time Pro Nitrous world champion with his "Party Time" '69 Camaro after winning the 2018 title. He leads a pack of ultra-competitive Pro Nitrous drivers made up of stars like two-time world champion Tommy Franklin, perennial title contender Jay Cox and the Pro Nitrous world record holders in ET and speed, Jim Halsey and Lizzy Musi, respectively. "We'll do what we can to get ahead of the chance of rain on Friday," Crossnoe said. "We'll pay attention to the forecast and do whatever it takes to get the race in on Saturday night." The PDRA East Coast Nationals presented by FuelTech will kick off with testing from 12 p.m. to 6 p.m. Wednesday and 10 a.m. to 7 p.m. Thursday. Friday qualifying will begin with the driver's meeting at 8:45 a.m., followed by the first sportsman qualifying session at 10 a.m. and the first professional qualifying session at 2 p.m. Sportsman final qualifying starts Saturday at 10 a.m., with professional eliminations slated to start at 4 p.m. The final rounds for pro classes are scheduled for 9 p.m. Saturday. Tickets to the PDRA East Coast Nationals presented by FuelTech are available for $15 for Thursday testing, $20 for Friday qualifying and $25 for Saturday eliminations. A weekend pass, good for all three days, is available for $50. Children 12 and under get in free. Tickets are available at the gate or online at www.pdra660.com/.